Do you have pee in your pool? GLI’s Splash Series boasts our versatile, patented Unibead structure allows for the replacement of overlap or beaded liners with one of our beautiful tile patterns. 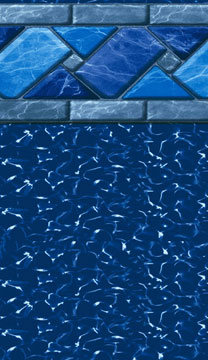 To replace an overlap liner, simply attach the Unibead J-hook to the top of the pool wall. If replacing a beaded liner, just remove the J-hook portion of the liner and install a standard beaded liner. Both options give offer a sleek, seamless appearance and offer an installation process that’s as easy as one, two, three! Made of durable, 100% Virgin Vinyl, the Splash Series Unibead liners come with a full year’s warranty as well as a limited 20-year warranty. Made with 100% virgin vinyl in the U.S.
Got right to work, and had the whole job completed in very little time. Above Ground Builder did an excellent installing the new liner, and it look great. I would recommend them to anyone needing above ground pool work..